In the beginning the fine particulate matter count is low (see bar on the right). While waiting for the traffic light to turn green, the values shoot up. When it is green the cause becomes obvious: two mopeds. 45 km/h mopeds and even 25 km/h mopeds are indeed a nuisance and dare I say it (as I'm pretty pragmatic): dangerous (to me and particularly parents riding with kids) on Amsterdam bike paths. Riders steer in a generally aggressive way (approach and passing very close) and the volume of scooters and alike have gone up considerably. As far as I know the 45 ones are not allowed on bike paths downtown, but need to be on the road where speed limits for cars allow that. Most of the 45-ers however use the bike path to go around busy car traffic and will often even go on the sidewalk to go around cyclists. I can't wait for the 30 km/h speed limit to go into effect in Amsterdam so that ALL of these mopeds, scooters and what not will just ride along with their other motorized friends. Apeldoorn's solution is great, I really like it. 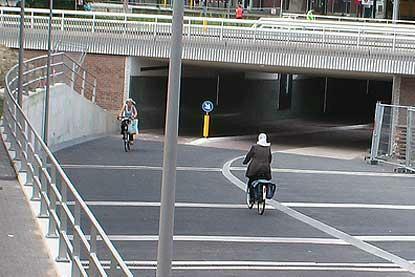 I marvel at the size of the tunnels /underpasses in Holland.Also the physical separation of Pedestrians and Cyclists which is a really important thing as they go at different speeds. Here is Canberra (Capital of Australia) which has the best cycle network in Australia has all shared paths at widths of between 2 and 3 metres. A busy underpass to a major towncentre near where I live, there is a barrier to stop cyclists from cycling too fast through the tunnel. The local municipality have refused to widen the tunnel which is only 3 metres wide, saying that it is acceptable for the amount of traffic traveling through. Not that they would want to encourage a greater use of the tunnel. what a neat tunnel! you guys think of everything!! Maarten, Amsterdamize: I think there are simply fewer brommers up here. They rarely annoy me. I do agree on the exhaust fumes and the aggressive riding which you get sometimes. I was cut up by a Brommer in a very nasty way in Eindhoven a few years back. As I recall, though, they feature remarkably infrequently on accident stats for Amsterdam. Of course they are remarkably infrequently on accident stats. Everyone can hear them comming a kilometer away, and then they jump into safety to avoid injury. "As I recall, though, they feature remarkably infrequently on accident stats for Amsterdam." Some cities will lump brommers and bicycles into the same category. That certainly doesn't help the statistics. I don't think mopeds are particulairly dangerous. Maybe their drivers are, but not the machines themselves. The exhausts however, are intolerable. Why the 2-stroke engines have not yet been banned, is beyond me. Mandate 4-stroke engines, filters, catalysers, whatever. Well, a moped is very popular among boys from 16 to 18 (pretty logical really) and especially that group is known for irresponsible behaviour, and driving recklessly. Puberty with the added hormones and the lack of planning abilities of the pubescent brain... So it makes sense that mopeds are dangerous, because their drivers are. This obviously does not mean that they should be allowed to bully other people. That being said, I do find mopeds to be annoying and sometimes even dangerous. I've never been pushed aside by a moped as often as I have been since I moved to Nijmegen. Compaired to Doetinchem Nijmegen leaves more to be desired, but the mopeds are especially irritating. Riding on the bicycle paths and honking for me to get out of the way while they shouldn't even be on the path in the first place... Maybe that comes with a bigger city, more mopeds? Doetinchem is much smaller than Nijmegen, and my observation is that there are much more mopeds here. Of course, this is only my personal observation. I have no idea about the real numbers. A friend of mine was hit & run by a scooter while riding her bike on the bike path in Amsterdam on Overtoom. She got hurt pretty badly. Daily I see scooters acting aggressively with bicyclists. They ride up fast behind bicyclists & scare them. Some lean on their horns too, which is quite brazen considering they should not be there in the first place. Some bike paths go between houses where motor vehicles should not go at all and the noise from scooters is a big nuisance for the residents. It is dangerous for the scooter drivers themselves to be jumping in and out of car traffic. As much as I detest their habit of riding on the bike lane, I would hate to see anyone get hurt. Like someone said, most of them are teenagers. It would be beneficial to scooters riders & bicyclists alike if the rule were respected.